Itzia means “Mayan Princess” and at 3 years old, she’s already part of the Delphinus family despite her young age. She weighs 136 kg and is a bottlenose dolphin, know more about her and the dolphins family. Some experts are undecided about including the white whale as part of the dolphin family, there are 37 different kinds, among which the killer whale, who is the biggest of all, a killer whale can measure up to 8.7 meters long. The dolphin family in Delphinus belongs to the Tursiops truncatus specie, better known as bottlenose dolphins, an adult of that kind can measure up to 3.8 meters long. When you experience the swim with dolphins in Mexico, you will notice how big they are! Even the babies measure between 1 and 1.3 meters long, not bad at all for being a little baby! What kinds of dolphins exist? As we said before, these animals are the most intelligent in the ocean, and they have particularities that you couldn’t even imagine, such as the echolocation through which they can produce sounds and with their fine hearing they hear the echoes that other dolphins produce, thus distinguishing the shape and distance of the elements around them. This characteristic allows them to sail, search for food or detect predators. Also, they’re very social animals, they form groups and families, with which they coexist and help each other. 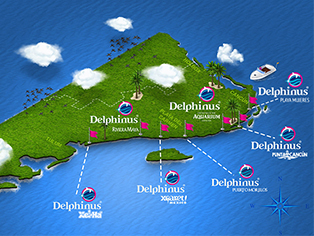 In Delphinus we are aware of these social bonds, that’s why the dolphins that you’re going to meet live in groups just as they would out at sea. Mothers and their babies stay together during the first 2 years of the baby’s life just like they would in a wild habitat. No matter which family they belong to, dolphins are incredible mammals. If you dare to live the experience and swim with dolphins in Mexico, you will learn more about them, because our Animal Care Specialist will teach you everything you need to know to make your interaction unique and you will understand the importance of this specie for marine life. Come and swim with dolphins in Mexico, and remember "at the end, we’ll only conserve what we love, we’ll love only what we understood, and we’ll understand only what we learned” – Baba Dioum.